Please call 877.659.9376 or Email us if you have any questions. Where can I get information about Long Term Rentals and Ski Leases? Click Here for our current Long Term Rentals and Ski Lease options. How far is Kirkwood from South Lake Tahoe? Kirkwood is about 35 miles from the Stateline, NV area. It normally takes 45 minutes to an hour, depending on traffic and current road conditions. Where can I get information about a Fallen Leaf Lake rental? Click Here for our Fallen Leaf Lake rentals page. Please keep in mind that our homes are very popular and often rented one year in advance. Call us today at 877.659.9376 to book your next vacation! Are there any homes for sale at Fallen Leaf Lake, Kirkwood or South Lake Tahoe? Click Here for our current list of available homes or call 877.573.1888 to speak to a real estate agent. What is going on in Lake Tahoe? Tahoe Onstage is a website that features an up-to-date event calendar and live entertainment news. You can also check out our Event Calendar. Is there someone that I call if we have questions? Each property is equipped with a guest book and that has all the numbers to call. You can always call 877.659.9376 if you are unable to access the guest book. We also have concierge services available, let us know what questions you have about Lake Tahoe. I plan on cooking during my stay. What do we have to bring? When you stay at Kirkwood it is always best to bring your groceries with you or shop in South Lake Tahoe. Kirkwood does have a few restaurants and a general store but that only has a limited number of items. Each home has all the basic pots and pans, dishes, silverware, cups and coffee mugs. Please bring any specialty pots, spices and oil as these items may or may not be stocked. What dining options are available at Kirkwood? The Kirkwood Inn is always open for breakfast, lunch and dinner. The General Store is also open daily for hot coffee or one of those items you forgot to bring. What is supplied and what do we have to bring? We supply all bed linens, bath towels, paper towels, toilet paper, dish sponge, dishwasher soap, garbage bags, iron, ironing board, hair dryer, travel-style bathroom amenities and a one day supply of coffee and tea. We suggest that you bring beach towels, groceries, spices, aluminum foil and bathroom amenities (we only supply a small amount of soap, shampoo, conditioner and lotion). Is there daily housekeeping available during my stay? We do not normally provide daily housekeeping but are available if you should need anything during your stay. There will be an additional fee for any extra cleaning services during your stay. Please call us at 877.659.9376 or Email us your request. Air Conditioning is not normally needed in Lake Tahoe as the temperatures rarely get above 90 degrees. There may be a few weeks during the summer that it gets warm during the day but cools off each night. We do recommend that you bring a light jacket, even during the summer months! All funds received are retained and non-refundable until unit is re-rented at same rate and time period less a $140 administrative fee. We strongly urge you to obtain the optional Vacation Rental Travel Insurance, which will protect your vacation investment if you must cancel for many unforeseen reasons. Restrictions can apply, please see CSA Policy. Where is your reception desk? We do not have a reception desk. Our homes are accessed by keyless entry or lockbox. The electronic door pad codes are provided to guests upon final payment and again three days prior to occupancy. We do have staff onsite 24/7 in both Kirkwood and South Lake Tahoe should guests need us for any reason. Our check-in time begins at 4 pm and check-out time is by 11 am. We are able to arrange an early check-in (2 pm) or a late check-out (1 pm) for an additional $50 fee each. For the single family homes, parking is available in the garage and driveways. 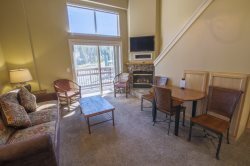 For the South Lake Tahoe condominiums, parking is available for one car in the spot designated to the property's number with street parking for additional cars. In Kirkwood, each guest will receive two parking passes, one for the designated property's number spot and one on the street parking designated by that building's HOA. For additional cars, there is complimentary overnight parking in the Upper Lot 7 across from Timber Creek and a daily paid lot next the The Lodge at Kirkwood. We do have pet friendly homes in South Lake and at Kirkwood. Call us any time to discuss details or check out our Pet Friendly Rentals page. If I'm a Hideout guest, what do I need to know? The Hideout takes 30 minutes to drive from Kirkwood (it's actually only 12 miles, but the last 2 miles are on a windy dirt road). It's best for the wedding party to set up a shuttle service for traveling between Kirkwood and Hideout. For those not used to the elevation, be sure to keep hydrated by drinking plenty of water. You will want to grocery shop prior to your trip as the closest grocery store is 35 miles away in South Lake Tahoe and restaurants in the summer are limited. Bring flat shoes, layers of clothing and plenty of sunscreen. **For guests on oxygen, please prearrange to have your tank refilled as you will need a prescription to fill the tank in California. Just realized that I forgot something in the home. Can you mail it back to me? We are happy to mail the items back to you but there will be a minimum $25 shipping fee. If the charges are greater, the guest will be charged accordingly.